tribal guarachero - mudd up! ¡Órale! Tribal Guarachero – “Aztec Rave from the Future” – keeps on rising. 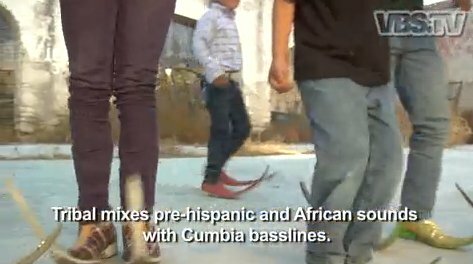 A quick review: There was my Fader feature on Tribal Guarachero in Monterrey from last year, now viewable online. Then came a National Geographic article suggesting that certain stone buildings in the Americas were Pre-Columbian ritual spaces for heightened sound reception and communal celebration — aka rave caves. My post on these Ancient Mayan Subwoofers contains a handful of tribal MP3s which very intentionally invoke Aztec and Maya pasts (as do the t-shirts and posters of Erick & Sheeqo). 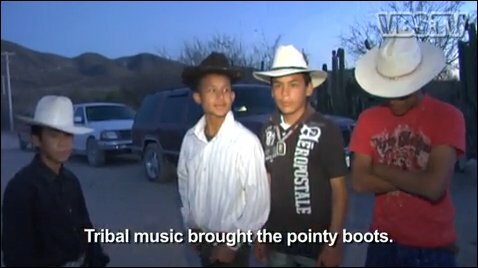 Next, VBS hopped into the game with a great little piece on the new music from Monterrey birthing a pointy boot craze in north Mexico and beyond. 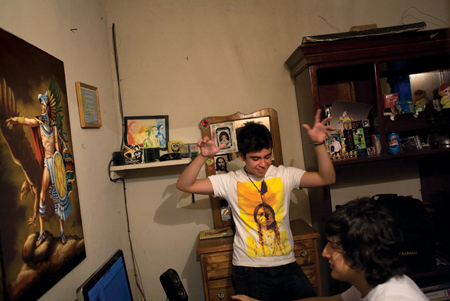 The big picture in all these stories is the stunning creativity and vitality of Mexican youth culture — other aspects of which Daniel Hernandez chronicles in his recent book Down and Delirious in Mexico City. 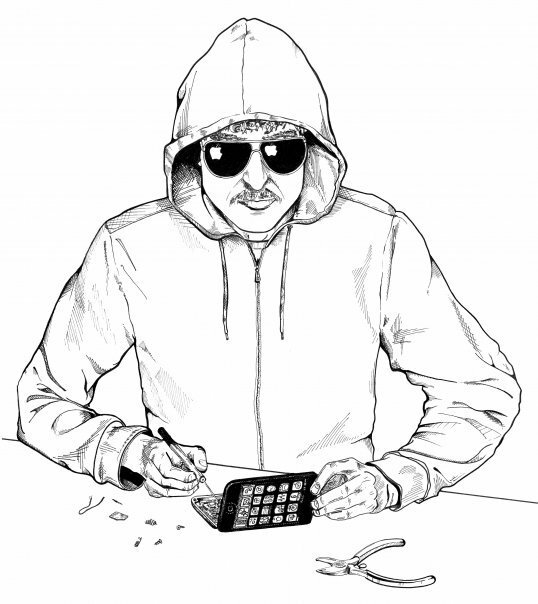 Here’s my previous post about the book, and here is his guest appearance on Mudd Up radio. And now these various manifestations of tribal guarachero take another step forward, as the pioneering Monterrey crew of 3Ball MTY (DJs Erick Rincon, Sheeqo Beat, and Otto) release their first official video, “Inténtalo (Me Prende)” complete with CD-J fetish shots and a pointy boot dance section. These are some of the nicest kids around and it’s so satisfying to watch them on the up & up. ¡Chequealo! And when you see Toy Selectah, buy that man a drink. 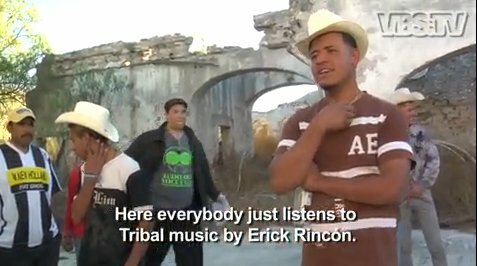 In the opening sentence of my Fader feature on the young Mexican music of tribal guarachero, I wrote that teen prodigy Erick Rincon ‘radiates preternatural calm.’ You can now witness that for yourself, as he appears on-location in Matehuala in this new VBS video — totally unfazed by the fact that his music, along with that of friends Sheeqo Beat and Otto has directly inspired a pointy boot (& skinny jean) craze with rodeo cowboy-ravers from north Mexico into the U.S. Incredible! Video below. Check this post for some tribal MP3s and reflections on ancient Mayan subwoofers. Maya temple ruins in Palenque, MX. Photo by Panoramic Images/National Geographic. While the jab ‘intentionally or not’ gives me pause (did they accidentally build an underground rave cave with exceptional acoustics? 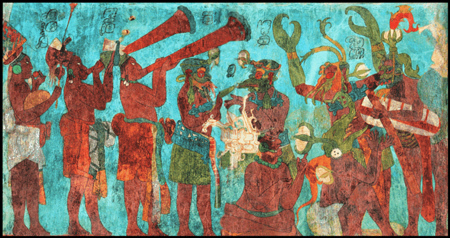 ), the thought of ancient Mayas carving out subwoofers in 600 A.D. is very 2012, very tribal guarachero. 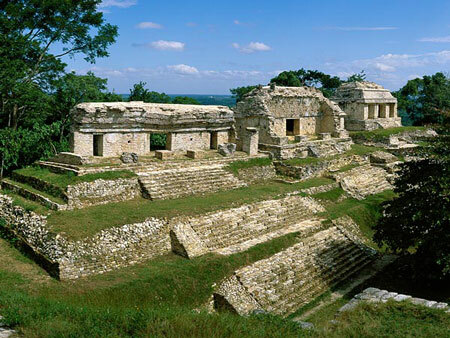 The temple ruins at Palenque in central Mexico suggests “a kind of ‘unplugged’ public-address system, projecting sound across great distances” — perfect for a post-oil dance party. Spaces of dance and celebration seem to be some of the most precarious pieces of urban real estate — hype clubs can fall out of fashion in a season, or, worse get shuttered overnight in capitulation to cop harassment, noise complaints, zoning shifts, all the various pressures of gentrification. So I love the idea that some of the most enduring structures in the Americas are Pre-Columbian ritual spaces for heightened sound reception and communal celebration. Longetivity! 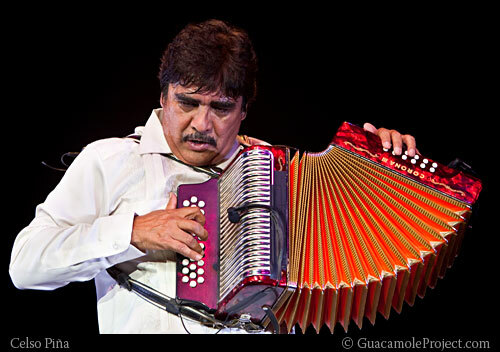 Which Mexican tribal guarachero music also participates in. These MP3s provide some quick examples of the genre very intentionally invoking Aztec and Maya pasts via sound and language. Even the beats themselves underscore a communal function: listened to as stand-alone tracks, they can seem repetitive or simplistic in construction. But it’s music meant to be activated by a dancing crowd and mixing DJ, played, of course, over an appropriately huge soundsystem (with or without electricity). When tribal (“tree-BALL”) first started bubbling out of Mexico City around 2005, they called it “tribal pre-Hispanic,” after Ricardo Reyna’s “La Danza Azteca”—the first tune to pull pre-Columbian samples into tribal house. This is what “tribal” now refers to: not tribal house, but Tribes—Aztec and “African,” which the music evokes via clip-clopping drum grooves and twee pre-Hispanic melodies. In Mexico City’s massive Zócalo plaza, which forms the new sound’s mythic home, Indians play flutes and drums in Aztec costumes, spicing the city’s unhealthy air with their burnt frankincense. The nearby pirate marketplace of Tepito stocks countless low-bitrate tribal CD-Rs. Rewind 500 years, before the Spanish arrived: Zócalo was the center of Tenochtitlan, the Aztec island-metropolis that happened to be one of the world’s largest cities. The only reliable now, even one scattered on cheap street CD-Rs, has the weight of history close at hand. 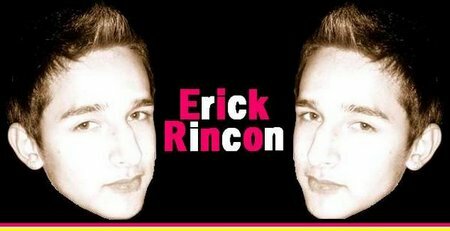 This sudden teen musical phenomenon self-consciously stretches back to the days of these Palenque raves. 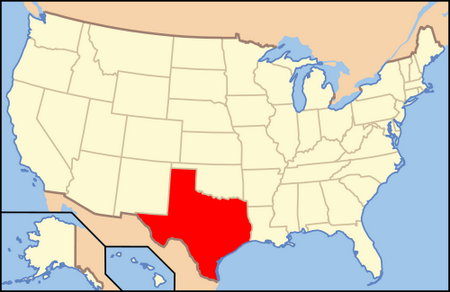 DJ Antennae – Nawy Kuahutli (anybody know what this Nahuatl phrase means? “If you can create a mysterious sound that seems otherworldly,” says British archeaologist Chris Scarre, “you’ve created something that is a very powerful and intriguing element in the ceremony.” “3ball Monterrey, putos! !,” he added.